I popped into a session at the recent ad:tech in San Francisco that covered Anheuser-Busch's Here's to Beer campaign and Verb, an active attempt to bring play back to the kiddies. ad:tech is quite possibly the only place where beer marketing and children can be discussed in one forum. Unsurprisingly, the beer moguls at Anheuser-Busch hold 49 percent marketshare in the US alone. Behind them are the fastest-growing market, import beers, which hold 12 percent. Beer comprises 56.3 percent of alcohol consumed in the States, with spirits (hard liquor) at 29.4 and wine at 14.3 percent. It boasts the following benefits: social, refreshment, moderation (they were the first tipsy-maker to reappear post-Prohibition), food pairing and health. If wine can get by on its bonne sante, so too can beer, because it's the alcohol content that yields the health effects. And here my silly self was thinking there were tannins involved. An apologetic salute to the overlooked hops of our nation. Interestingly, beer is also toted as democratic - it transcends socioeconomic boundaries and joins people. "You can have a beer with the guy who mows your lawn," the speaker explains. Anheuser-Busch outlines the tactics they already use to get to people: press and pulpit, ads, beer holidays and web marketing. 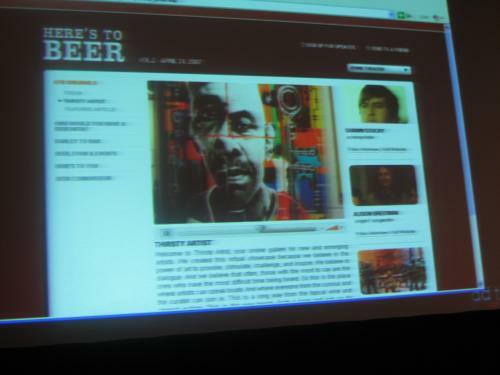 In 2006 they launched Here's to Beer, which educates people about the culture of the hop, inviting us past the homepage with a not-so-subtle Thoreau quote comparing its fine history to the grape. There's also a section in the site marked Thirsty Artist, where the dehydrated and artistically inclined are highlighted. Well, it's not like they'll ever run out of subjects. "I drink because I am sad. I am sad because I drink." Some artistically-angsty wisdom from The Little Prince. Of particular interest was Anheuser-Busch's collabo with MingleNow, the same guys wandering around taking photographs of everybody at the ad:tech parties. Instead of a banner ad or full-on Web wrap, Anheuser-Busch embedded itself into the MingleNow social culture with Clink, a campaign where bar-hoppers can appear on a streaming page if they send in photos of themselves clinking beer glasses. As MingleNow grows, so too does Anheuser-Busch's user base. 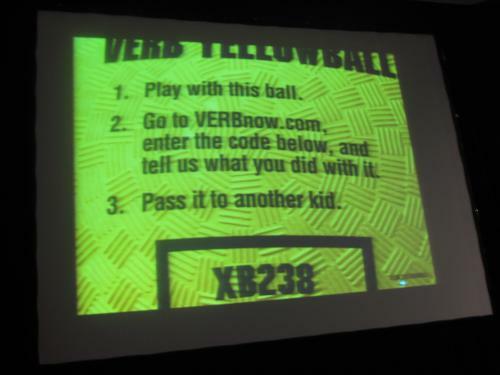 The session transitioned abruptly to the Verb Yellowball campaign. This effort seeks to fight obesity in tweens by encouraging them to go out and play. They consider non-active forms of entertainment to be competition, so a major problem with pushing the campaign was getting it beyond sedentary media like television and the Internet. The Yellowball campaign is pretty nifty. Verb dropped 300,000 yellow balls out in the world, leaving some on playgrounds or sending them to influencers like Hilary Duff and other kid-ebrities. They featured three rules and the travels of respective balls could be traced back to their origins. I like the idea of finding a big yellow ball someplace. How is it that one graduates from balls to beer? It would be awesome if Verb and Anheuser-Busch crossed swords to bring play back to inebriated twenty-somethings. Consider the fun and games that would ensue. Clinking kickball. Do you see it?